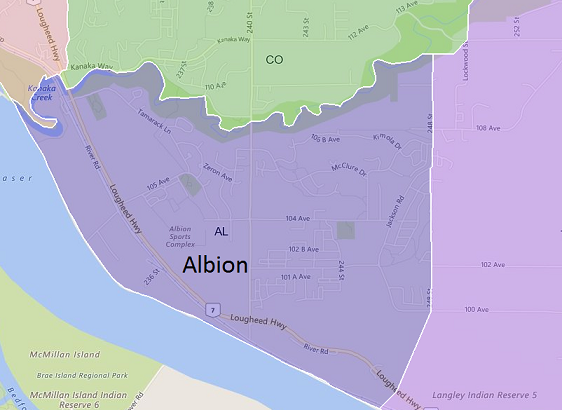 Albion, British Columbia is a neighborhood (sub area) in Maple Ridge. The Albion area is situated by the Fraser River waterfront, Kanaka Way, and 240th Street. Albion is rich in its people & history. Its historic economy was driven by sawmills, canneries and fishing boats. Albion Fairgrounds, sports facilities and nature trails make the area a great place to live. Albion is the fast-growing area in east Maple Ridge and a great place to invest, live or retire! To begin Search "Property Type" First, then other features and scroll down for results below.